In addition to large pieces of commercial restaurant equipment like ranges and ovens that are necessary to cook the components of a meal, many operators rely on smaller pieces of equipment to ensure prepared meals are perfectly finished. When it comes to tasks like heating plates, melting cheese, finishing steaks, and toasting bread, chefs may turn to a cheese melter or salamander. Because they look similar and can both be used to apply heat to plated dishes before serving, it can be difficult to distinguish between cheese melters and salamanders. Still, the two types of equipment should not be used interchangeably. True to their name, cheese melters are generally the go-to tool for melting cheese on top of pastas, sandwiches, and French onion soup. They are also frequently used to toast bread and may be used to keep dishes warm after food is plated. Put simply, cheese melters are only designed to be used with food that has already been thoroughly cooked and requires some light finishing before service, which is why they're sometimes called finishing ovens. 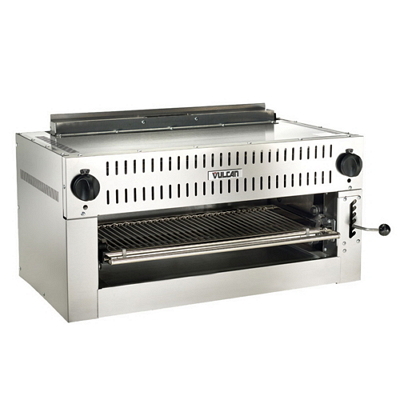 This light-duty equipment can also be implemented as a way to reheat some menu items like slices of pizza or bread prior to serving, offering the convenience and superior heating capacity of an oven without eating up a large footprint. Cheese melters are available in electric and gas models, and may be wall-mounted or used as countertop equipment. Some cheese melters are designed with a removable rear panel that allow them to act as pass-through units, which can be useful if the cheese melter is being used to warm plated meals between the kitchen and a serving station. They can also be used to melt cheese and toast bread, but salamander broilers offer a wider range of applications because they're built with more powerful heating elements. Salamanders are capable of not only heating food, but actually cooking it, so they can be used to broil fish and vegetables, brown chicken, and finish steaks. Salamanders are also commonly used to finish au gratin dishes and other meals that are best served with crispy, caramelized layers on top, and may be used to heat cast iron platters, like the ones used to serve fajitas. 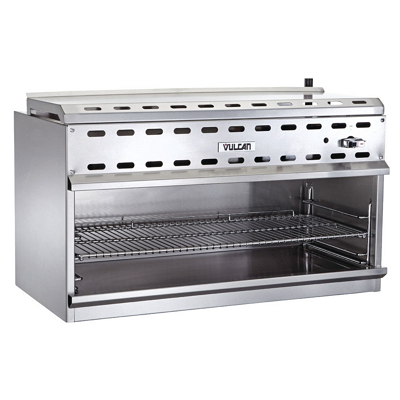 Although salamanders are available in countertop models and wall-mounted units, they are commonly mounted above ranges to maximize workflow and cooking capacity, especially when cooking proteins. Commercial kitchens that need to do more than toast bread or melt cheese should consider investing in a salamander broiler to supplement an existing range during peak service times.